Successful businesses are built on satisfied customers and excellent services. AMSOIL provides the synthetic edge in protection, helping you succeed by preserving the power of your equipment, extending equipment life and maximizing reliability, allowing you to work more efficiently, honor your commitment and put more money in the bank. AMSOIL 20W-50 Synthetic Hydrostatic Transmission Fluid is specifically formulated to deliver smooth, responsive operation in zero-turn mowers, stand-on mowers and other equipment professionals rely on to make a living. 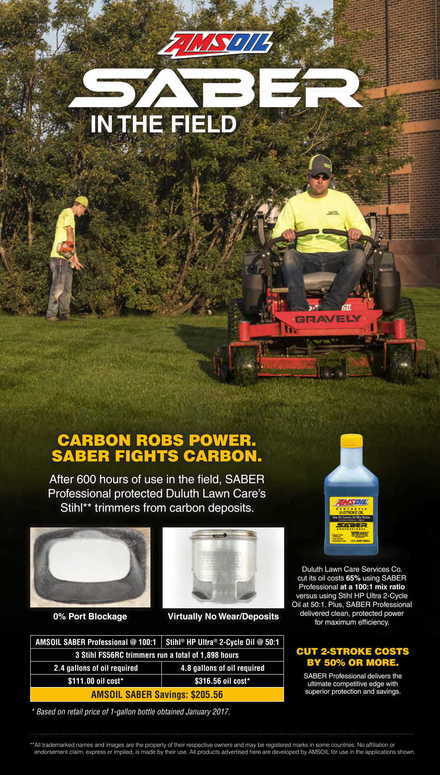 It fights wear and viscosity loss during continuous, severe service operation, maximizing mower speed and operability. Unlike motor oils, Synthetic Hydrostatic Transmission Fluid is purpose-built to withstand the unique demands of hydrostatic transmissions. It lasts up to 2X original equipment manufacturer (OEM) recommendations, helping professionals save money and reduce downtime. Formulated to outperform passenger-car/light-truck oils, AMSOIL Synthetic Small-Engine Oil protects against wear, deposits and oil consumption in over-worked, under-maintained small engines professionals rely on to make a living. Using a high-quality small-engine oil has a direct effect on efficiency and profitability. Over time, wear and deposits rob small engines of power, reducing productivity. 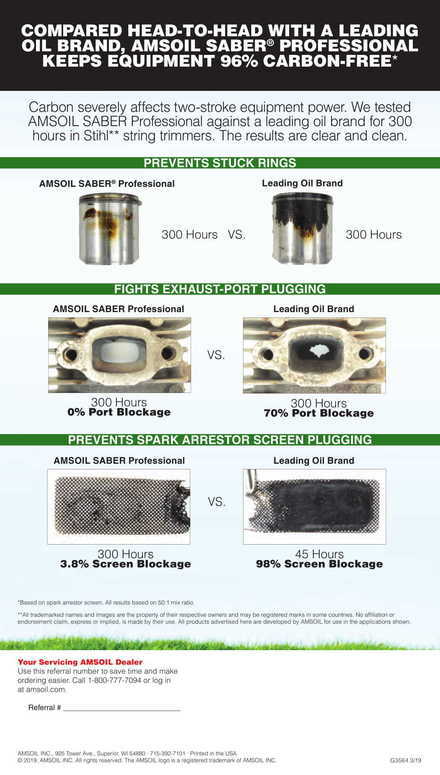 High heat can cause oils not formulated for severe service to boil off, leading to increased oil consumption, forcing the work crew to continually top off the oil. When your reputation is built on deliverying projects on-time and on-budget, downtime on your skid steer or excavation equipment is something hyou can't afford. Fortified with more additives and top-grade synthetic base oils, AMSOIL synthetic lubricants protect against wear and sludge while resisting oil consumption better than conventional lubricants. The result is the peace-of-mind that comes with knowing your investment is protected no matter how severe the condition or workloads. AMSOIL engineered Formula 4-Stroke Small Engine Oil to withstand the high temperatures of hard working engines. It effectively resists oxidation and oil vaporization to control oil thickening and reduce oil consumption. AMSOIL Small Engine Oil lasts longer in service than conventional oils and keeps engines clean for peak operating efficiency. AMSOIL Formula 4-Stroke Small Engine Oil is a shear stable formulation that contains no friction modifiers. It will not break down during rigorous mechanical activity, making it ideal for hydraulic or hydrostatic systems and chain cases. It is wet clutch compatible and designed to prevent clutch slippage in commercial or recreational transmissions. AMSOIL Formula 4-Stroke® Small Engine Oil protects gears and bearings during high-demand, commercial duty service.